Last year I heard there was something called Ice Bikes in Buffalo. Of course I wanted to check it out but every free weekend didn't work out weather-wise. We were having such a mild winter, I thought maybe the ice was slushy. This past weekend we HAD to go to Buffalo to pick the Smart Car up from the garage so we decided we might as well check out the ice bikes. Turns out the bikes are at Canalside, where there is actually an ice rink. I thought it was just a frozen canal but it's a maintained rink so there is more control over the ice. The weather was mild when we visited but the ice was fine. There were lots of people there skating and hanging out. Buffalo did a really nice job with Canalside. You can rent skates, ice bikes, try curling or even get a snack in one of the tents or a food truck. They have nice heated tents with lockers and seating for changing into your skates. Back to the ice bikes. They are a very cool invention of a bike mounted on a frame with skate blades. I really wasn't sure how well they would work but they really cruise along! The bikes are very responsive and easy to maneuver. 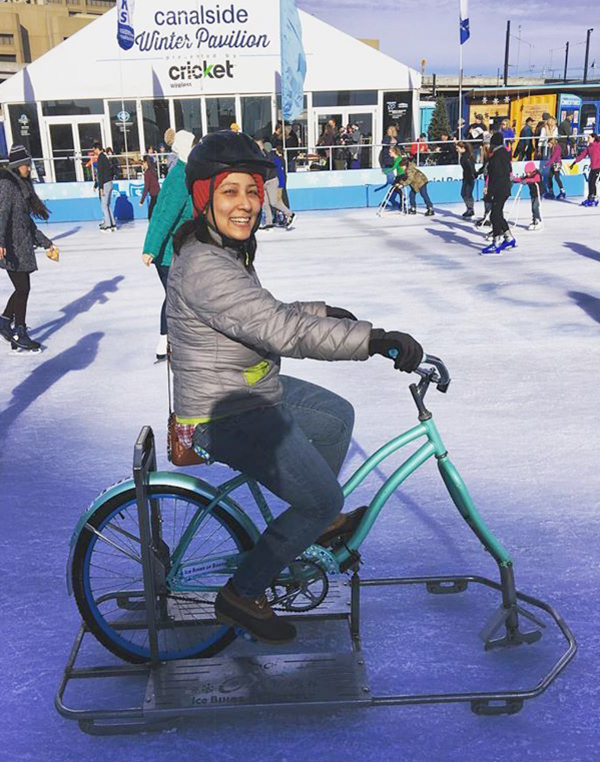 The bikes can be rented by the half hour which is plenty of time to get your fill of biking around the rink. I'm so glad we got a chance to try out the ice bikes this winter. I think they would be great somewhere like the Rideau Canal in Ottawa where you could bike for miles. And I would love something like Canalside here in Rochester! Winter activities help you get through the long season of snow and ice.